It has been a while since the last time I did a recipe on here (because I was back home eating out like crazy every week :P). For my come-back, I will bring you an extremely easy and hearty side dish for the winter, which is conveniently suitable, since we have like eight months of winter a year in Finland. Let’s jump right in the recipe! Cut the brussel sprouts in half, place them on a baking tray lined with baking paper. Season with salt, pepper and ginger powder (you can add cayenne pepper or garlic according to your liking, but I kept it simple with these seasonings). 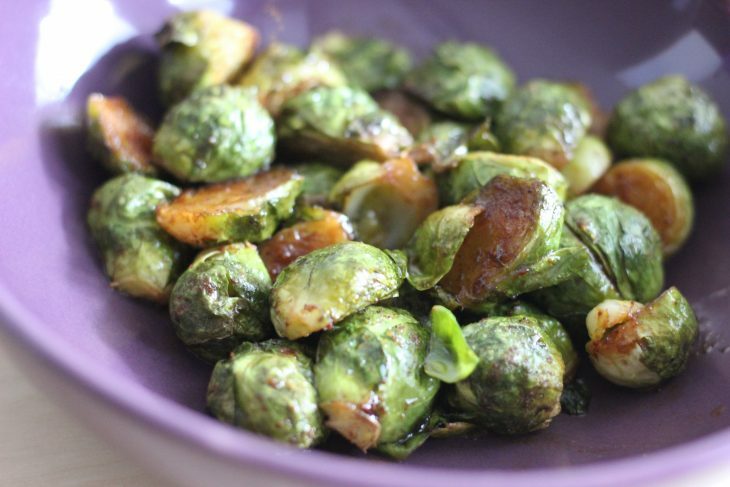 Drizzle the brussel sprouts with olive oil, toss them around till all the brussel sprouts are evenly coated. Place them cut sides down into a 200 degrees Celsius oven for ~15 minutes. When they are slightly golden, take them out of the oven and quickly drizzle on the mustard and honey while they are still hot. Serve them with your main dish (preferably salmon or steak) or eat them as they are. There you have it. A wholesome and flavorful dish which takes maximum 25 minutes to make. Make this the next time you want to add veggies to your meal but boiled broccolis have become too boring. I hope you enjoy this week’s recipe. See you on the next one!